I have a succulent collection planted outside in (currently) 5 recycled tires, and in my semi-shade screen room in south Florida. 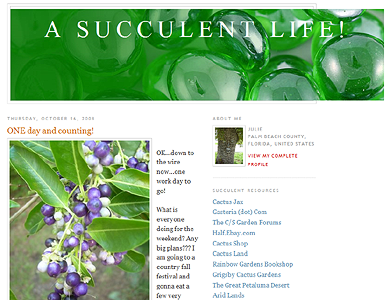 I blog about anything, but include my succulent plants frequently. I am married with 4 grown children, and other than my chihuahua, Doozey, my succulent plants are my latest "babies"!